Bundled up and ready to tour Muckross House! Muckross house is located near the town of Kilarney in southwestern Ireland. We went there — twice — last week. We had to work hard to see inside of the house, but I knew my three traveling companions would enjoy seeing the place. Dave and I had been there in 2003 and had a splendid time and other friends of ours mentioned this as a highlight. So we scurried there after seeing the Ring of Kerry, checking the official website for opening times. It indicated the house was open 9-5:30, seven days a week, in winter. But although we arrived at about 4:20, the place was shut tight. There was absolutely no sign of life inside the ticket booth or house and there were no signs posted with the tour times of opening hours. However, the restrooms and grounds were still open and the park ranger assured us the house would reopen at 9 the next morning. So we headed back to Cork for the night — an 1.5 hour drive — and hurried to the house again early the next morning. We attempted to phone the Muckross office starting at 9 AM, but no one would answer the phone. When we arrived at 9:30, the two ticketing agents told our host, Tony Duggan, that the first tour would be given at 11:30. They said to visit the grounds until the tour started. He let them know we already had! Fortunately for us, the man is a CEO and knows how to get things done. After all, we had other sites to see on our last day to the region. He managed to finagle a tour at around 10. We experienced a fairly curt delivery of information with little opportunity to ask questions, but nevertheless, we enjoyed seeing the house. I hope when you go to visit this fine building and learn its interesting history (it was last owned by an American family who gave it to the Irish people) you have better luck with scheduling than we had! Grand entry of Muckross house. 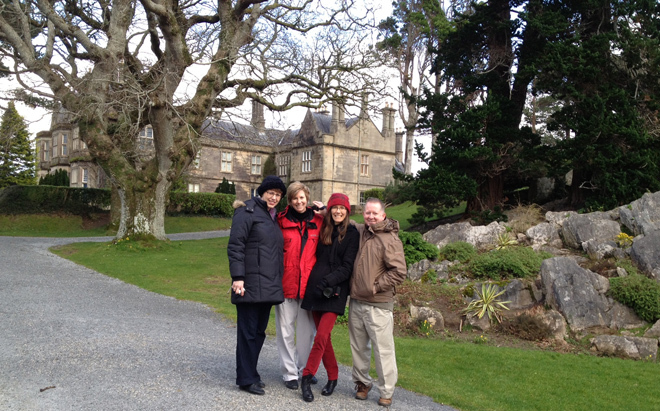 Kitty Lee, Patty, Shannon, and Tony at the lovely Muckross castle/house. The ladies (Kitty Lee, Patty, and Shannon) at Muckross House). There are winter gardens and greenhouses. What a beautiful little structure! A constructed view — they built this lake as a view for the house, I learned in 2003. Carriage rides are available around the grounds. Kitty Lee, Patty, and Shannon at Ladies View, where Queen Victoria and her Ladies in Waiting stopped during their visit to Muckross. Kitty and Patty thought the Hobbits might appear.